Abstract. 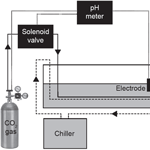 This article describes a potentiometric ocean acidification simulation system which automatically regulates pH through the injection of 100% CO2 gas into temperature-controlled seawater. The system is ideally suited to long-term experimental studies of the effect of acidification on biological processes involving small-bodied (10–20 mm) calcifying or non-calcifying organisms. Using hobbyist-grade equipment, the system was constructed for approximately USD 1200 per treatment unit (tank, pH regulation apparatus, chiller, pump/filter unit). 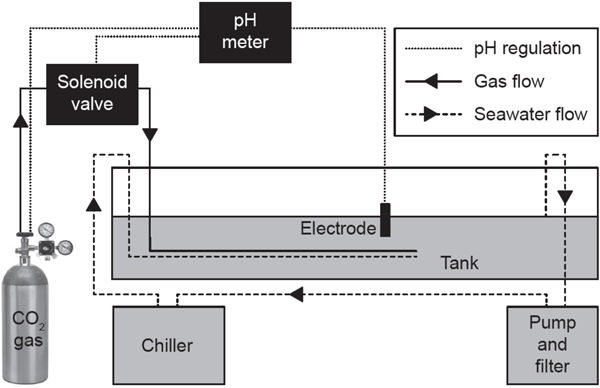 An overall tolerance of ±0.05 pHT units (SD) was achieved over 90 days in two acidified treatments (7.60 and 7.40) at 12 °C using glass electrodes calibrated with synthetic seawater buffers, thereby preventing liquid junction error. The performance of the system was validated through the independent calculation of pHT (12 °C) using dissolved inorganic carbon and total alkalinity data taken from discrete acidified seawater samples. The system was used to compare the shell growth of the marine gastropod Zeacumantus subcarinatus infected with the trematode parasite Maritrema novaezealandensis with that of uninfected snails at pH levels of 7.4, 7.6, and 8.1. How to cite: MacLeod, C. D., Doyle, H. L., and Currie, K. I.: Technical Note: Maximising accuracy and minimising cost of a potentiometrically regulated ocean acidification simulation system, Biogeosciences, 12, 713-721, https://doi.org/10.5194/bg-12-713-2015, 2015.